An action plan is a list of steps designed to take you from where you are to where you want to be. The most important part of any action plan comes after you compile it. It will be no more than a piece of paper with words on it unless you actually take action on the things you list in the plan. Use a piece of paper, a journal or the template available in the Everyday Productivity Workbook to draw up your Lifestyle Action Plan, using the findings from your Lifestyle Self-Audit. Write down the steps you intend to take to either maintain or improve your current level of health and fitness. Be as realistic as possible. If you need to lose some weight, by all means set yourself a weight goal but don’t kid yourself you can do it in a few weeks. Go back and read some of those sites you found searching online for ‘body weight’ to help you work out a realistic time frame. If it’s a long time since you exercised regularly, start with walking for ten minutes a day instead of rushing off and joining the gym. We’re talking about establishing new habits. They take time. If you don’t do the cooking in your household, discuss your plans with the cook. If you eat out or buy take away all the time, consider learning to cook or reverting to home cooked meals. Do some research online to get an understanding of what healthy eating looks like. Hint: fresh food figures in it a lot. If you have no idea when it comes to cooking, let me suggest a little book I wrote for guys living alone: Cooking 4 One. It’s about the basic processes. Cooking is not that difficult but, again, it’s a choice. 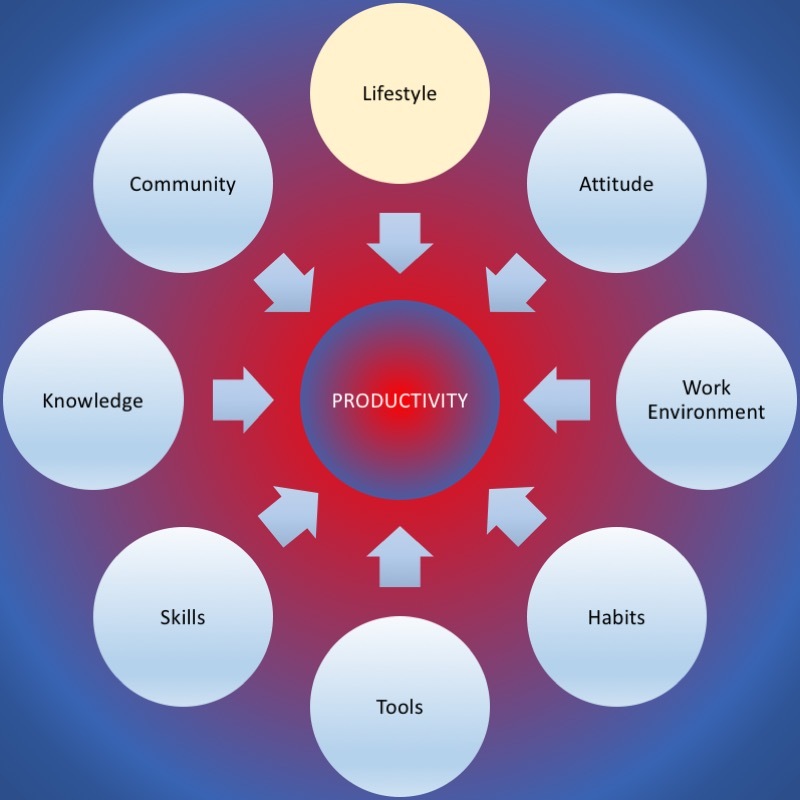 If you want to be productive and to lead a healthy life, you’re not going to make it while you’re abusing your brain. If you need to take action to address substance abuse, it will not be easy, and you will need to be honest enough with yourself to seek help. If you want to give up smoking, type ‘smoking consciously’ into your search engine of choice for information on how you can quit. I assume you know how much you earn each month; but do you know how much you’re spending? No, I’m not going to ask you to keep a spending log but I am suggesting that you invest the time required to get a firm understanding of your current cash flow situation. However, if you find that you can’t account for a significant amount of your spending, then you might want to keep a spending log for a week or more to see where those missing dollars, pounds or euros are going. This is an exercise that is best completed using a spreadsheet but it can be done on a sheet of paper with the aid of a calculator. What you need to complete this exercise is a copy of the accounts that you pay and your bank account statements, and I recommend that you do it for a complete financial or calendar year. If you are an employee, use your net income; that is, the amount you actually receive from your employer – that’s the amount you’re trying to live on. If you’re self-employed, use your gross income. Taxes and levies are expenses you need to allow for each month. Even if you only pay them quarterly or annually, you need to have the cash to do that at the time. You also need to account for your business expenses as well as your personal expenses, and know the difference between the two if you want to avoid disputes with the tax authorities. 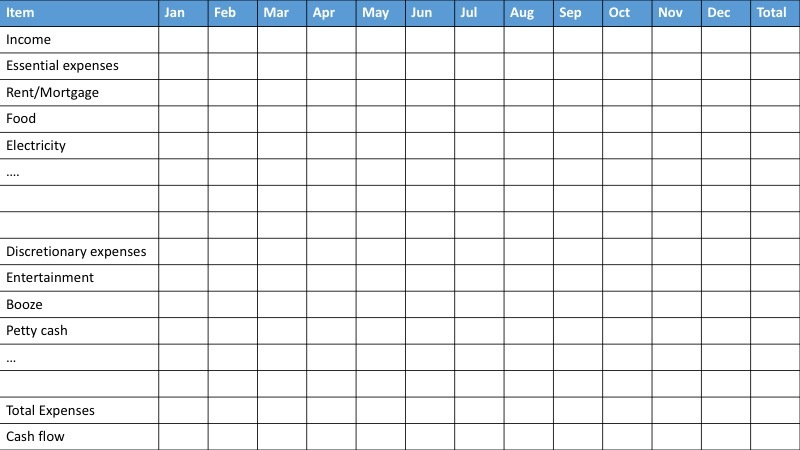 Draw up a table with months across the top and a list of income and expenses down the left hand side. Group your personal expenses into two categories: essential and discretionary. Essential expenses are the things required for survival; like food, water, housing, electricity and clothing. Discretionary expenses are not related to survival. They’re expenses you have a choice about, things like going to the movies, eating out, a new pair of shoes, cigarettes and life insurance. Some of your expenses will be regular in the sense that you need to pay them every month or quarter. For example, expenses like rent or mortgage payments are usually both fixed in amount and regular in frequency of payment. Food and utility payments, on the other hand, may be regular in frequency of payment but variable in amount. Items like car expenses may vary both in frequency and amount. How many credit cards are there in your household? Remember to include any loan and credit card repayments you are required to make as expenses. To keep things simple, I suggest you create an expense called ‘petty cash’ as a catch all for the money you spend on low value items like coffee and lunch during the month. The important point is to get it as accurate as you can without stressing over every dollar, pound or euro. When you have filled in the table, total your expenses for each month. Then, for each month, subtract your total expense amount from your monthly income, and record the result in a separate row labelled cash flow. If you used a spreadsheet, you might want to graph that result. It’s also valuable to compare the total of your annual expenses with your total income for the year. If your annual expenses equal your annual income, you need to do something. If your expenses exceed your income – you definitely need to do something. Hint: If you have credit cards and you can’t clear the debt in a particular month, you spent more that month than you earned. If you have rolling credit card debt, which you never seem to be able to pay off, you’re spending more than you earn. In the final analysis, if you need to do something, there are only two things you can do: earn more income or spend less money. If spending less is your only viable option, you need to draw up a plan – also known as a budget – and apply self-discipline. 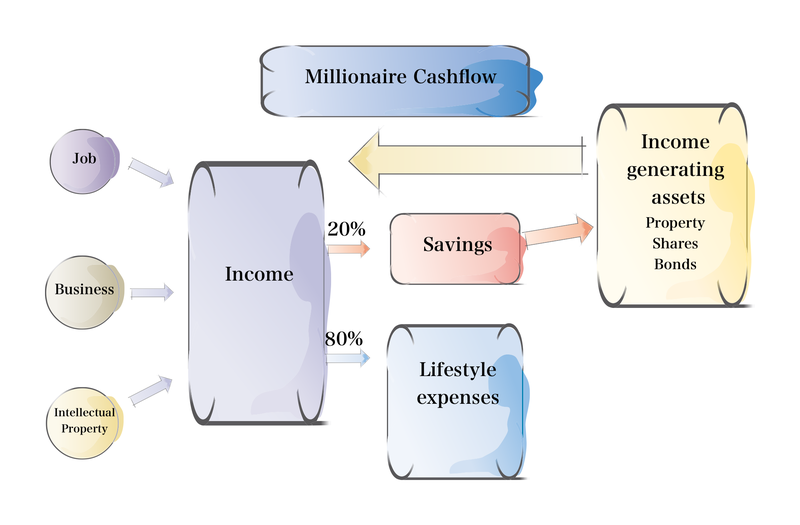 The people that become millionaires understand this diagram, and exercise the self-discipline required to direct 20% of their income into savings, so that they can convert their savings into income generating assets. Being wealthy is not the same as having a lot of income. It’s about creating or owning income generating assets. If you spend all your income on your lifestyle you can have a great time – until the income stops. Like everything else in life it comes down to the choices you make. For some, living alone is a lifestyle choice. For others, it’s an outcome. It’s not a life sentence to loneliness – unless you choose that option.